What a straightforward money-making concept: Serve fast food nicely packaged to the kind of people that care about packaging, in a trendy looking restaurant in a stylishly young area, with music on full blast, to the hungry and drunk people that will inevitably stumble into the place after an exhausting night of bar and club hopping, either to continue their debauchery or satisfy their booze munchies. You know you're not at a Jack-in-the-Box kind of fast food place when you see a bouncer there or see Tecate being served simultaneously at the fast food counter with a Strawberry milkshake. At night, especially on weekends, the action is in the stylish lounge in the back. The lounge also has a different menu that features more uppity (yes, expensive) snack foods. 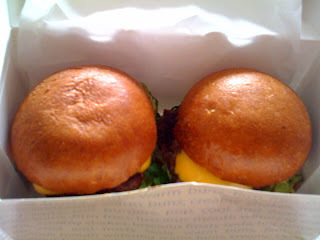 Their POP burgers with cheese are great – mini sliders that come as a duo for $6, meat is cooked well done with very melted cheese, tomato, and a bit of lettuce. Not bad for the price of the burgers which will fill you up. The only gripe is that they should ask you how you want your meat cooked. We would have liked them cooked medium well. 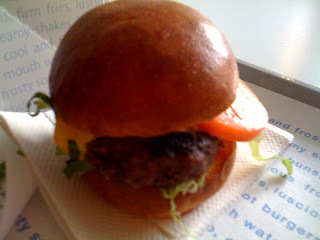 The seasoning of the burger was perfect - a little salt and pepper topped with a special sauce. Their onion rings ($3.75) are crispy and not too oily. We didn’t have one ring in the batch that was falling apart (as you might sometimes find in other fast food places). 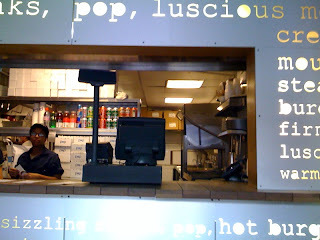 Another good thing about POP Burger, you can also get hot dogs (served as a double for $7), cupcakes (also served as a double for $6), and milkshakes. 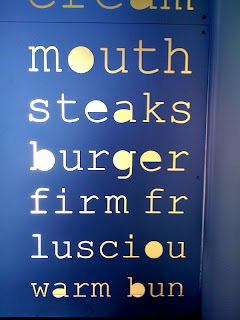 The décor is mod-kitschy, with brushed steel walls with backlit words describing its menu carved into the walls, along with modern art displayed. This is not your average grease spoon joint. The first time I went to this place, it was very late at night on a weekend and swarming with a very young inebriated crowd of stumbling drunks. But I still managed to enjoy the food and my time there. But this time around, we definitely wanted to avoid this sort of boozing infestation so we went around 6:30 pm on a weeknight. As expected, it was pretty empty and the crowd was completely different - the suits and ties sitting alone looking tired as they try to find comfort of the day's bump and grind in the sliders. We enjoyed our meal, in an uncrowded atmosphere, with hip hop as our companion, with people walking by staring at us stuff our faces. 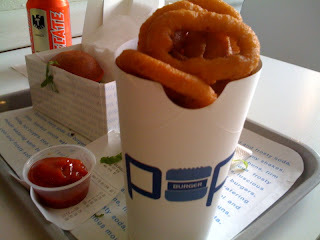 Pop Burger has classic New York City hours of operation: Sun – Wed they're open until 2 am and Thurs – Sat they’re open until 5 am. They open every day at 11 am. They also deliver (with a $10 min.). 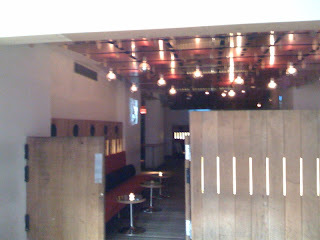 POP Burger has a second location at 14 East 58th Street, a gigantic more lounge/bar version of its Meatpacking sister with three levels – the first floor is takeout/self-service sit-down, and the second and third floors are bar and lounge. Apparently, it only took six months to build this place. 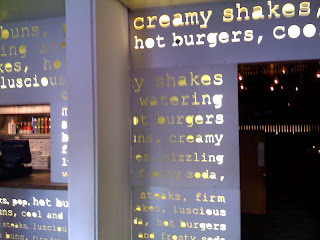 Hopefully our next burger trip will be at Shake Shack. Yes, yes, we're doing the touristy stuff, but we're not here for long so why not.